Every time summer rolls around in Barcelona, there seem to be about a million things to do all of a sudden. The good weather definitely brings along a helping of good times. Between traditional celebrations, classic Barcelona fun, and a happily contagious laid-back attitude, there are nearly countless reasons why summer in the city is nearly always a lot of fun. (Except for those days when it’s too sticky and hot to move. But that’s just an excuse to have more ice cream). 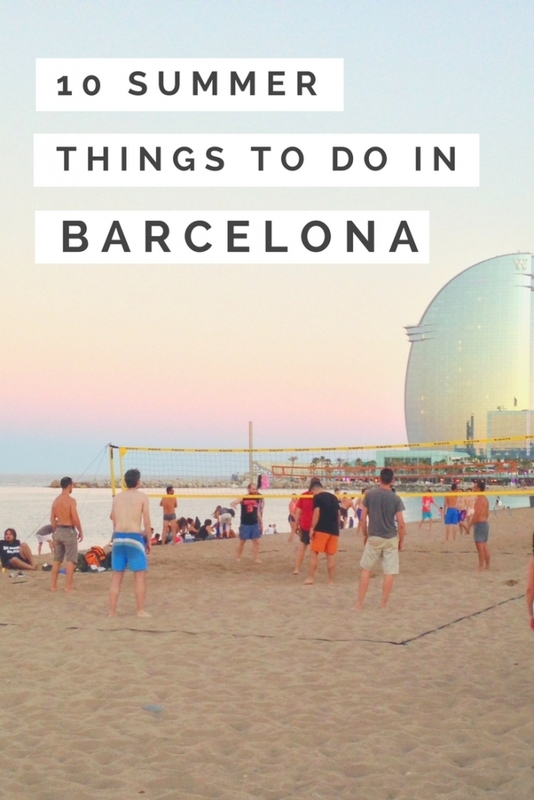 So, here are my top 15 tips for the best things to do in Barcelona in the summer. I was going to to 10, but there are just so many! 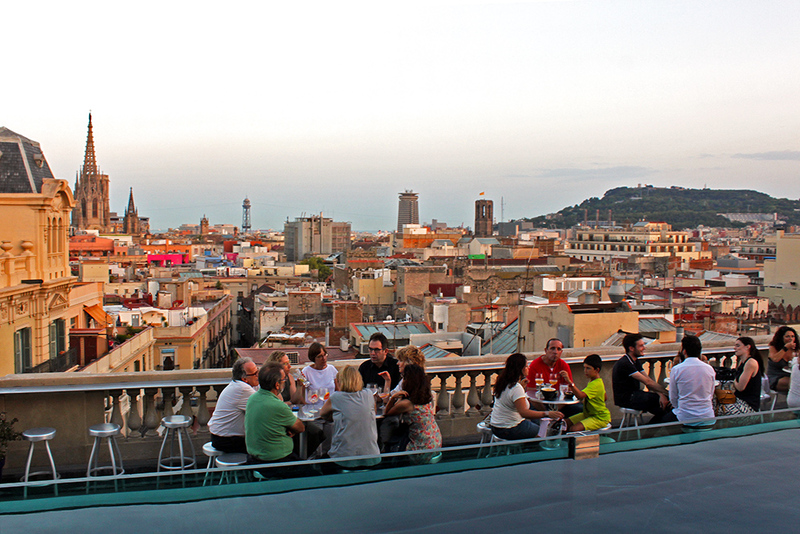 If there’s anything that locals love to do in Barcelona when the weather is good, it’s eating at the outdoor terraces! There are plenty of restaurants that have outdoor seating, though the competition for these coveted spots can be stiff – so show up early and be willing to wait. One thing to keep in mind is that some restaurants do charge a bit extra for the privilege of sitting on the terrace. Look out for words like “suplement terraza” or “suplemento terraza” on the menu. 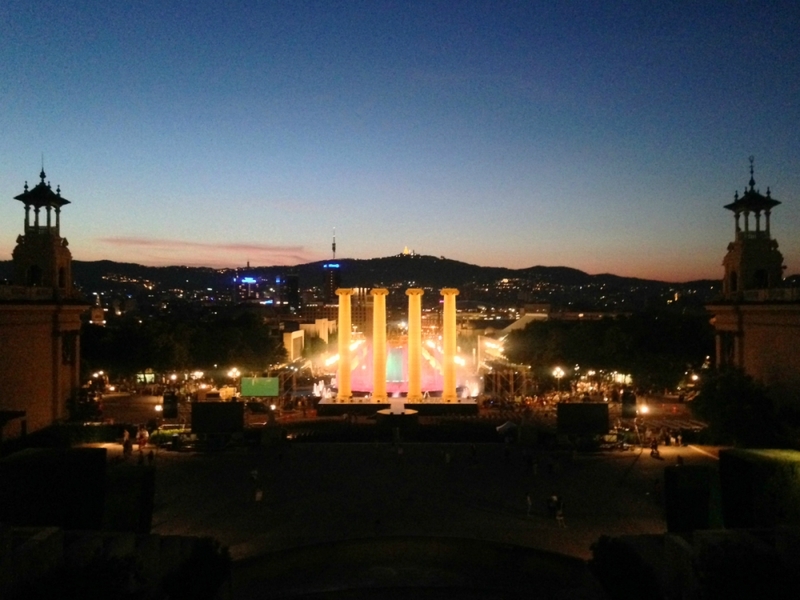 It’s hard not to fall under the spell of the Magic Fountain, the light, water, and music performance at the foot of the grand staircases leading up to Montjuïc. The fountain runs nearly all year round, but the best time to go is in the summer months. Not only are there shows five days of the week (Wednesday to Sunday), but the weather is also nearly always perfect for sitting outside with a picnic as you watch the show. There are a couple competing tapas routes that happen during the summer in Barcelona sponsored by competing beer companies. De tapes per Barcelona, Vespres Inedits, and Food Explorers de Ruta are some of the bigger ones. 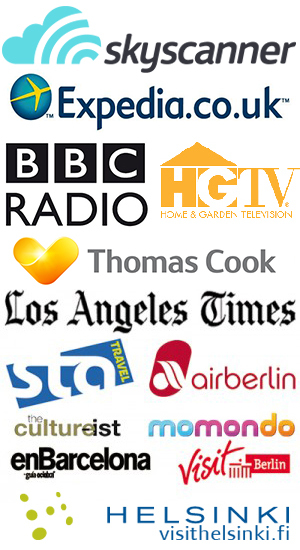 Check at this link and this link to see if any are happening near you. The basic idea is that a bunch of restaurants create a special tapa for the event, and compete to have the best tapa of the bunch. You can eat the tapa with a small beer for a couple of euros. These routes do happen year-round; there are just more of them in the summer. They also aren’t exclusive to Barcelona! There are also events in other cities around Spain, including Madrid and lots of smaller cities near Barcelona. 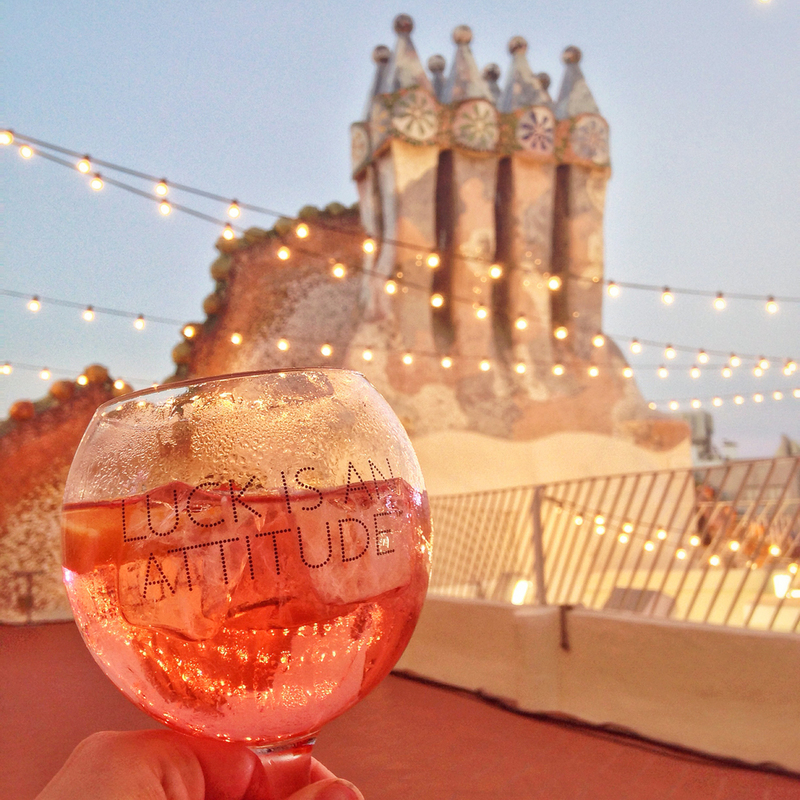 Barcelona locals love eating outside in the summer months – and they also love drinking outside! Starting around May, the rooftop bars start opening up their doors for the season. You can find many of them at the fancy hotels in the city, and nearly all of them have sweeping views of the cityscapes below. Expect to pay a bit more than on the streets below, but it’s worth it for views like these, not to mention the welcome breeze that often makes it way to the rooftops. When night doesn’t really set in properly until well into the evening, it’s easy to find yourself staying out into the wee hours when in Barcelona in the summer. It’s even easier when it seems like half the city is out and about, too. Why not join in the all-night fun? Every time you see these beautiful words “Fiesta Mayor de…” on anything this summer, you should start making room in your schedule. These are traditional local neighborhood parties, and throughout the year each district has its own. 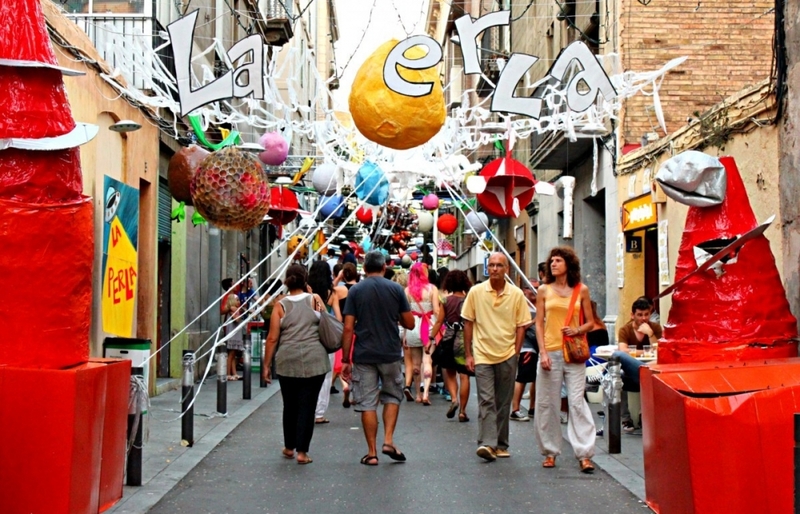 The two biggest celebrations of the year, in Gràcia and Sants, happen one after another in August. This year, the Gràcia festival celebrates its 200th anniversary, so the party will be bigger than ever. Watch a movie at the castle – or the beach! Movie nights in Barcelona get an extra touch of glam during the summer, because they’re hosted in some truly spectacular locations. 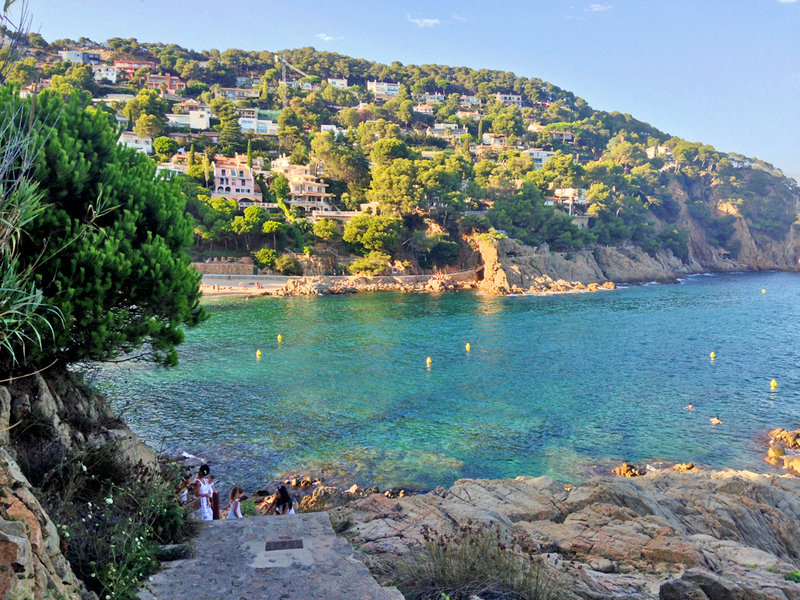 You can go up to the castle for the Sala Montjuïc or head down to the beach. (Both times I’ve gone to the Montjuïc version, it’s been rained out – after weeks and weeks of no rain. So if you see me there, I hope you’ve brought your umbrella). Sometimes, even the staunchest fan of Barcelona needs a little escape from the heat and pace of the city. The Costa Brava, the wild coastline that starts in pretty Blanes and stretches north, is the favorite getaway for lots of barceloneses. Try Cadaqués or Tossa de Mar. Round up a group of friends for a laid-back picnic session at the Parc de la Ciutadella. It’s hard not to enjoy this much-needed green break from the city center, especially as there’s some top-notch people watching to be had. When you’re tired of the park, you’re conveniently right next to the Born district, full of fun shops, bars, and restaurants to keep you occupied. 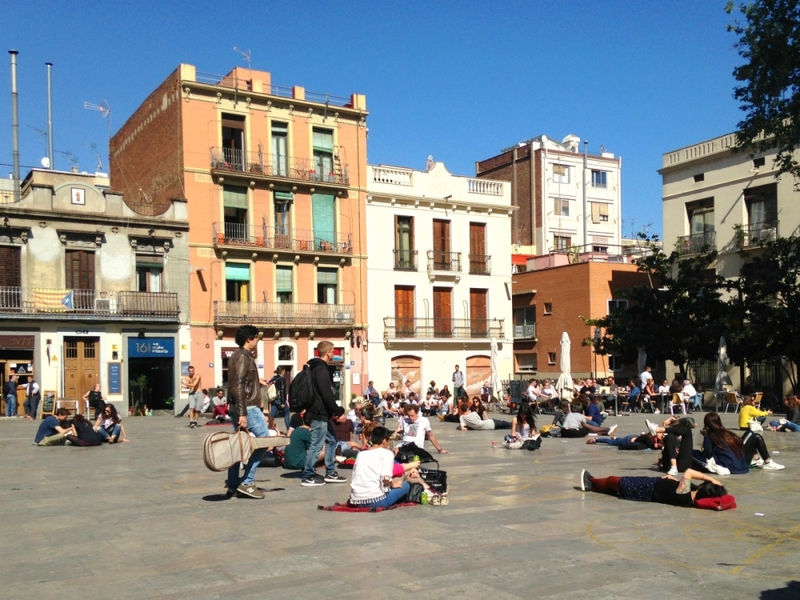 A true Barcelona classic, Plaça del Sol is the heart of the bohemian Gràcia district, both in terms of physical location and in spirit. The square is lined with terrace restaurants and cafés, which inevitably fill up at lightning speed. That doesn’t stop people from still showing up the square; they just sit on the floor with a couple of beers bought form the supermarket instead! There are multiple convenience stores to buy beers and snacks near the square. But you should really go into the Bodega del Sol, which has craft beers from around the world. It’s a bit pricier, but the beer is much better. There are lots of different music festivals in Barcelona in the warmer months. 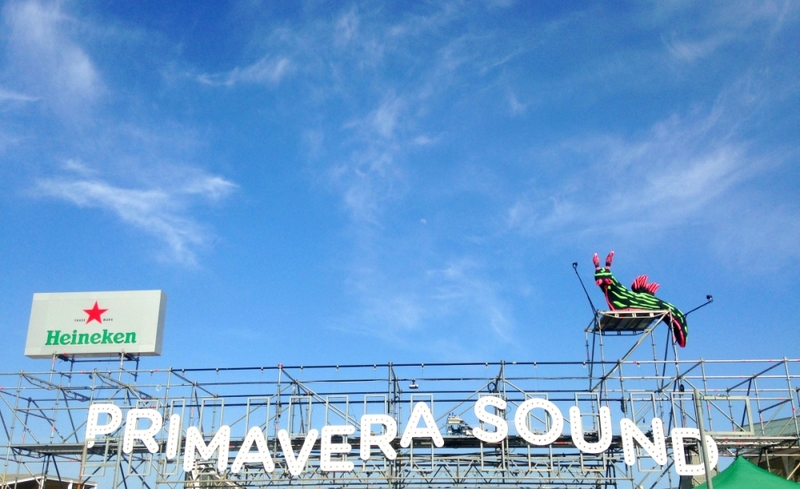 Primavera Sound and Sonar are the two best-known, though there are plenty more! The Cruïlla festival brings an eclectic mix of groups to the city, along with a nice helping of local bands. DGTL is a great one for lovers of electronic music, and also features a lot of design and art. You could even head south to Vilanova to go to the Vida Festival. Don’t fancy splashing out a bunch of cash on a ticket to a music festival? You can still enjoy plenty of open-air concerts in Barcelona in the summer that are either free or inexpensive. Music in the Parks has 50 completely free concerts of all different styles around the city’s parks and gardens. Poble Espanyol, a village-sized are with scaled-down replicas of some of Spain’s most iconic sights, hosts a program of concerts and events that run all summer long. …or fancy concerts at Gaudi buildings! For a truly special night in Barcelona, you can enjoy live rooftop concerts at one of the most iconic buildings in Barcelona, Casa Batlló, at its Magic Nights. La Pedrera also hosts a rooftop show, though in this case it’s a nighttime light projection onto the twisting towers and shapes on the terrace. You won’t get many more memorable views than these. The Fabra Observatory sits high on a slope in the Collserola mountains overlooking Barcelona. It’s a great place to get spectacular views year-round, but in the warmer months they also have a “Dinners With Stars”. You can enjoy dinner along with the views, plus a nighttime visit to the observatory to peek through its huge telescopes at the night sky. (One note – this isn’t a budget option; menus start from €71). 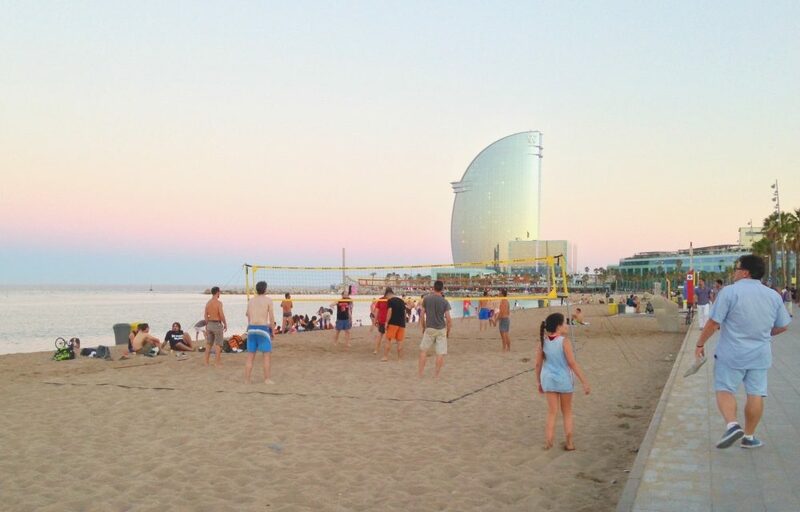 Yes, Barcelona has a beach – and summer time is the time to go! Of course, being a city beach, it’s not exactly empty. But it’s still pretty great to have a beach right in the city itself. My favorite time to go? Late afternoon so you can watch the sun dip the waves in gold as it sets. Beach beer in hand optional. OK, so even 15 items wasn’t enough! Here’s one more thing that’s perfect to do in Barcelona in the summertime – take a bike tour with Steel Donkeys. The city is perfect for exploring when the weather is good, and this is a really entertaining tour. For even more tips on what to do in Barcelona, from Gaudí’s masterpieces to the best kids’ attractions check out Barcelona Things to Do. Ahh, doesn’t this just make you wish summer could last forever? 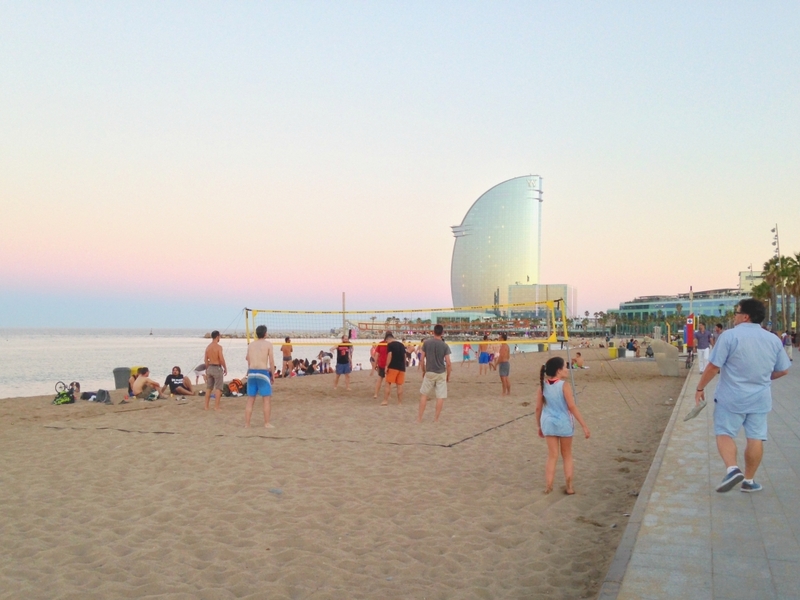 What’s your favorite thing to do in Barcelona in summer? If I’ve missed something, let me know in the comments! Some great suggestions. Just came back from three days in Barcelona with friends from North America. We spent a day at Mount Tibidabo and loved it! We are museum buffs so enjoyed the underground Museu de Historia de Barcelona in Barri Gotic, once we finally found it! Great list! I have only been to Barcelona in the spring. Can’t imagine how awesome it must be during the summer. Can’t wait to go check out some roof top bars. Barcelona is such an amazing city. Thanks, Mao! 🙂 It’s so much fun in the city in the summer. You should definitely try to make it here for the summer! Great read! what is the name of the rooftop bar in the photo? Having a beer at Placa del Sol is mythic! Great article, I went to Barcelona in February 2017 and after reading your article I wish I went in the summertime now haha! 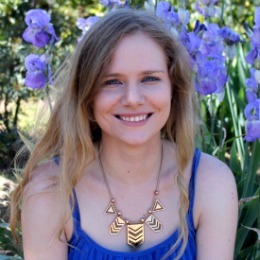 Were do foreign people hide in Barcelona? It would be nice to meet people from other countries that live in the city 🙂 I’m from Barcelona and I have lived here all my life. It would be nice for me to practice English, because some day I would like to try to live in an other country. If you want to contact me, feel free to contact with the email I submitted. Hello Jessica, thanks for the informative post. My hubby John and I are a professional mountain biker and we are planning to visit Barcelona for mountain biking. But we did not find enough resource. Can you give us some advice, please?